I am just baking away today!!! With all of these sweets breads and other goodies, I was in some serious need of some savory food that was healthy, guilt-free and tasty!! I showed you a few weeks ago my Artichoke and Jalapeno Ranch Dip that I loved so much that I made it three times since I posted it. Well I took that dip idea and changed it around and came up with one of my new favorite all time dips!! 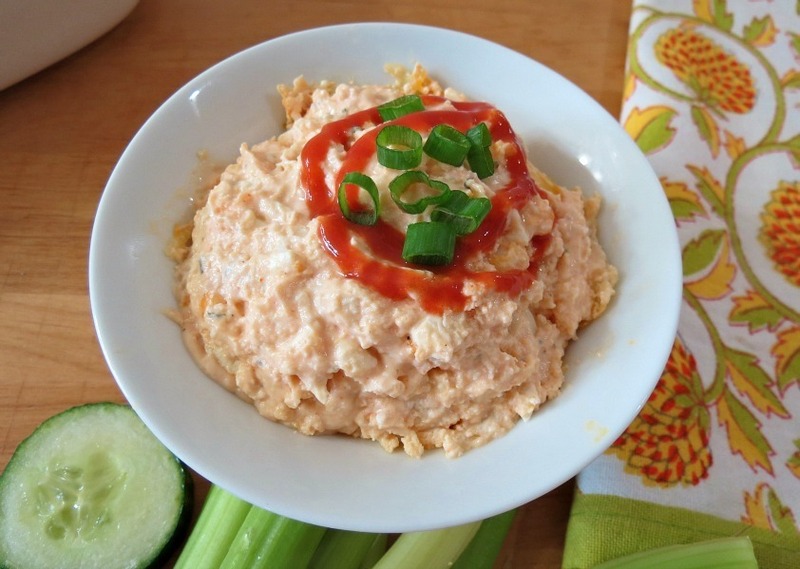 This is my Buffalo Chicken Wing Dip! Being from Buffalo, I love my chicken wings, but I will not eat them because of the calories! Did you know that one chicken wing is about 100 calories and about 5 – 8 grams of fat? No thank you! You know once you have one wing, you can’t stop there. Next thing you know you have eaten like 10 of them!! So instead of wings, bring me dip! Just as tasty, if not more and is only 110 calories for over 1/4 cup serving with less then 1.5 grams of fat!! This dip is fantastic!!! It’s made with fat-free cream cheese, plain greek yogurt, fat-free mayo, cooked chicken, Franks Hot Sauce, which is only the best hot sauce ever and reduced fat cheddar cheese!!! 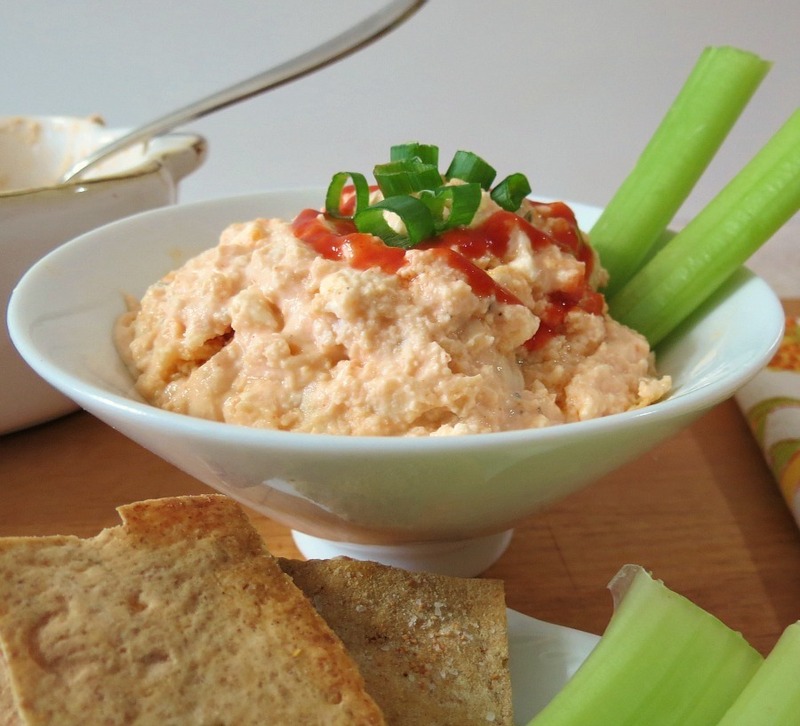 This dip is creamy, spicy and oh so perfect!! It’s not only good for dipping celery, carrots and chips in, but it is also amazing on a chicken wrap! Yes please! That is what I am going to do with it for lunch tomorrow!! This dip is perfect for snacking throughout the week, serving at the holidays or I bet it would be a huge hit at a Super Bowl party! It’s so easy to make too! Just use already cooked chicken, which a rotisserie chicken would work great, mix it all together and bake for 30 minutes. Cook it until the cheese is all bubbly!! Wait for it to cool and serve!!! Oh baby, this is what it looked like cooled a bit. 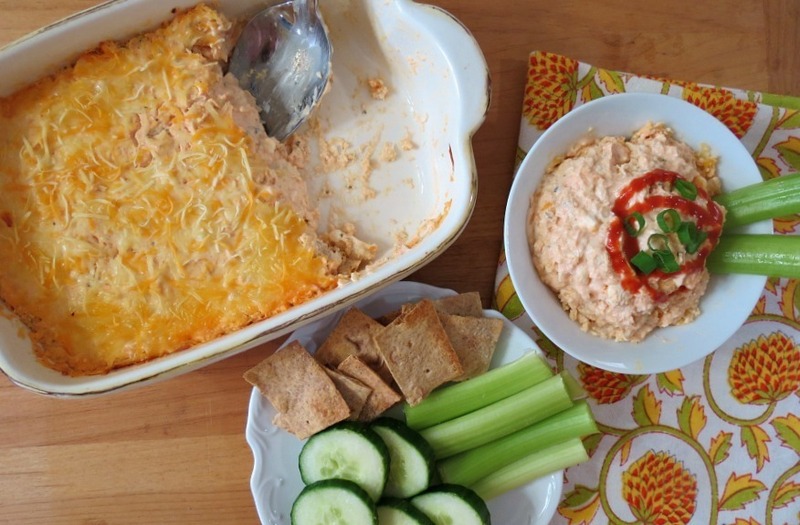 A spicy creamy baked dip that is made with cream cheese, greek yogurt, chicken and Franks Hot Sauce. In a bowl mix together yogurt, mayonnaise, cream cheese and ranch seasoning, until incorporated. Stir in hot sauce and chicken. Sprinkle top with cheddar cheese. 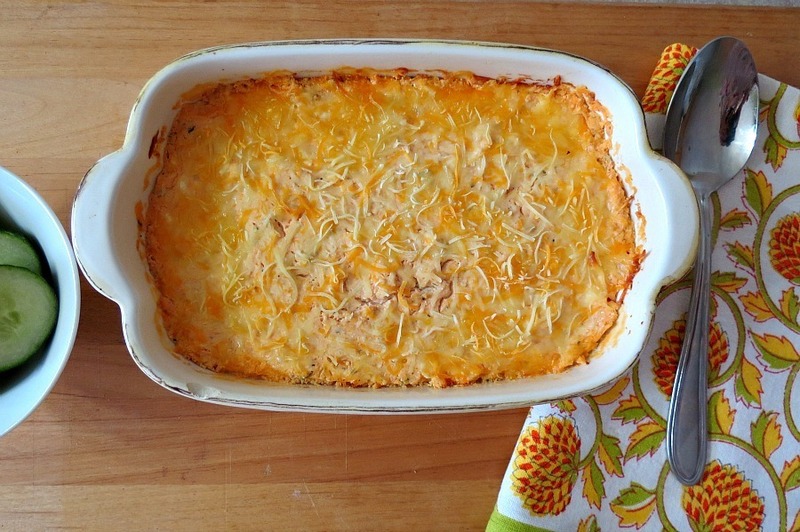 Place in oven and bake for 30 minutes until cheese is bubbly. I didn't measure the servings, since I didn't want to take apart the dip, so I made the whole dish to serve 6, which is approx. ¼ - ½ cup. Believe me the calories are pretty low on this one and the serving size is pretty huge. Have a great day everyone! I have some homemade bread in the oven that needs to come out! Have a great day! I simply cannot be trusted around dips. any sort of dips. and buffalo is my favorite kind. 🙂 Trust me, I am a dip hoarder at parties and you can’t peel me away. Love that this is a healthier version of the stuff. PS: “Toodles” – haven’t heard that in ages. Love it! No guilt here! I love it! I am such a dip and condiment person! Finishing it up with dinner tonight! 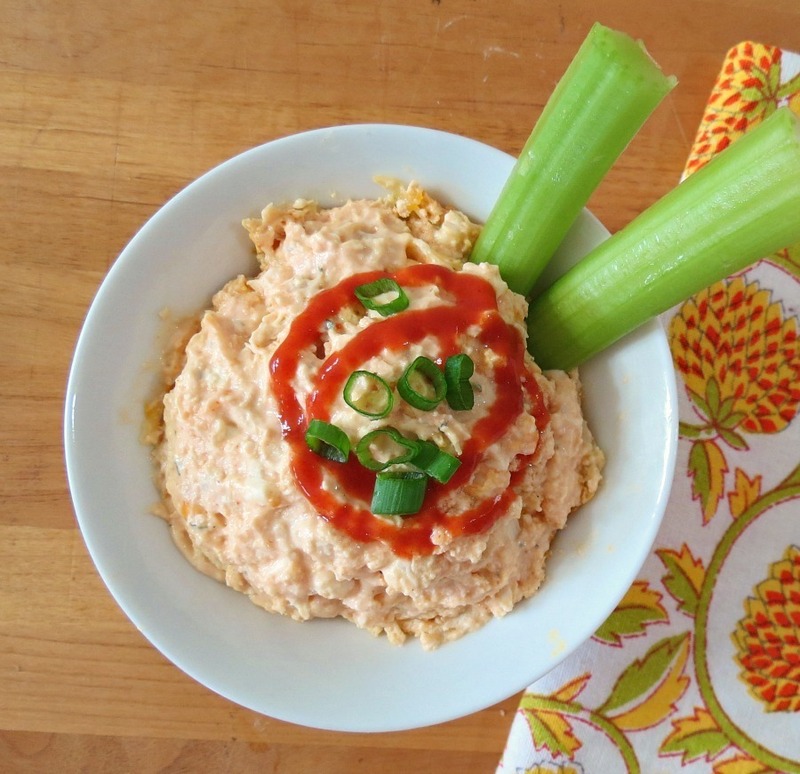 Buffalo chicken must be in the air… I posted about it today too! But it’s not as virtuous as your dip 🙂 I’ll HAVE to give this a try! Your baked potato looks amazing! Love that idea!! Thanks Kristi! I understand ya! All this baking, tasting and cookie dough is killing me! lol But I love it!! Oh yeah, bring it on! 🙂 What lovely combination of ingredients in this delicious dip. Thank you! We love it too!!! I love dips, they are so addicting! I’m glad you came up with a healthier version! Oh my gosh, I could eat this whole thing! YUM! Trust me, I did over two days! My mouth is watering!! Congrats on being in the Huffington Post! !